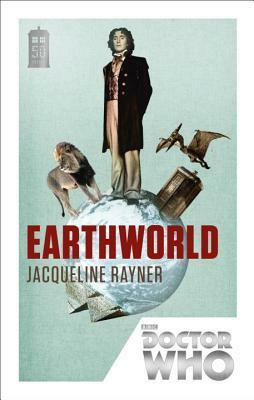 Thanks to TLC Book Tours, we're pleased to present a review for Earthworld, an Eighth Doctor adventure, by Jacqueline Rayner. Make sure to check out the rest of the tour stops to see other reviews, and keep reading to enter to win an awesome giveaway! Anji has just had the worst week of her life. She should be back at her desk, not travelling through time and space in a police box. The Eighth Doctor is supposed to be taking her home, so why are there dinosaurs outside? The Doctor doesn't seem to know either, or else he surely would have mentioned the homicidal princesses, teen terrorists and mad robots? One thing is certain: Anji is never going to complain about Monday mornings in the office again. In honor of the 50th anniversary of Doctor Who, BBC Books has reissued/redesigned/reawesomed a series of eleven books -- one for, you guessed it, each Doctor. Earthworld focuses on the Eighth Doctor and his companions Fitz and Anji. What's just supposed to be a quick pop back to Earth -- real Earth -- turns into a trip to New Jupiter, where, of course, trouble ensues. Fitz and Anji, both new characters to me, were both ones I'd love to spend more time with. Fitz grew up during WWII and fancied himself to be a singer when he met up with the Doctor in the 60s. Anji meets the Doctor and Fitz in 2001 for what was supposed to just be one adventure. They've got pretty rounded-out personalities of their own, and can carry their own storylines well. You miss the Doctor when he's not on screen, so to speak, but Fitz and Anji are both pretty fun to read about anyway. The book reads just like an episode of the show, which, of course, is the point. The Doctor and his companions, predictably, get separated and all wind up with their own issues and puzzles to solve, and everyone has to rely on their own strengths and intelligence to make sure that they get a happy ending. Some of my favorite parts of the story revolved around the often humourous, close-but-no-cigar interpretations of Earth throughout history that the people of New Jupiter have made. These were responsible for lots of laugh out loud moments on my part. The book's downfall is really the same as the show: the Doctor often makes completely wacky leaps of logic, and you don't always know how things progressed from point A to point C. Things get very fast paced at times, and scenes switch rapidly between our three main characters. That all can make the plot hard to follow at tines, but it's also true to the source, so I can't really ding the book for that. This book, and I suspect all books in the series, work best if you have a functional knowledge of Doctor Who, though you certainly don't need to be an expert. I'm more familiar with New Who than the original eight Doctors, but a quick Wikipedia read filled me in more on what Eight got himself up to, and Fitz and Anji's backstories. (And even that was kind of unnecessary, I was just overly curious.) Like the show itself, the book is a fairly clean read, with some violence and sexual innuendo. The Doctor and his companions use a very unique spin on the story of King Arthur in Earthworld, but he's also been dubbed Sir Doctor of TARDIS by none other than Queen Victoria herself. (p. 48). And thanks to TLC Tours and BBC Books, we've got a great giveaway! This one is open internationally, so you're all eligible. (Well, maybe not if you're on Gallifrey, that might take a lot of postage.) Enter in the Rafflecopter for your chance to win your choice of Earthworld, The Silent Stars Go By (an Eleventh Doctor story, reviewed here next week), or the trivia book Who-Ology! I've heard a lot about Doctor Who. About the series and how good it is. I think I'm going to start watching it on Netflix. It would be pretty awesome to win one of the books! Thank you so much for such an awesome giveaway!! Same here! I would see it and be like, now this is going to be a great series and I always have heard how good this series is. I will definitely start watching it now! Thank you for the recommend! I'll have to let you know how I'm liking it when I can start watching it! Oh I almost forgot, did you watch the UK version or the US one? And do you know which version is better? Thank you so much for writing me back! I just started watching the show last week on Netflix, I have no idea why it took me so long! It's really good!